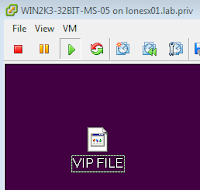 In this example, we have a file on our desktop called ‘VIP FILE’. The backup has been run and the file subsequently shift-deleted. Apologies! This is as far as I can go with my lab setup (which currently doesn’t have an Exchange server). If the SMVI default email notification settings are not set at this stage, when you click finish, the wizard will error as below. 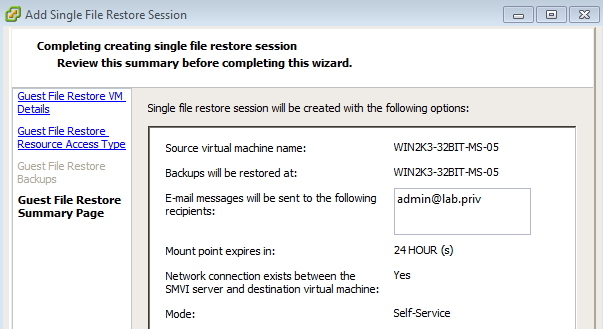 Hopefully this post is sufficient to give an idea of what the single file restore process involves. PS If there are enough requests (comments), I’ll get an Exchange box setup and complete this post when I get a chance! HI, Thanks a lot for such wonderful information. I am getting the same error, I have exchange server in my environment. 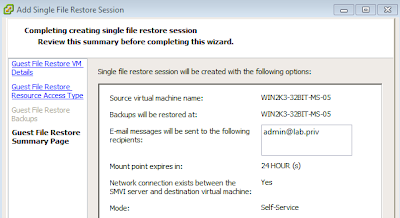 Where should I configure the email setting can you please guide. "please set the SMVI default email notification setting and try again"
Pues para eso no pongas nada, chaval, vaya truño.